SHAZAM myPIC Studio allows you to create a personalized debit card featuring any photo you choose - of loved ones, friends, a pet or a favorite vacation spot. 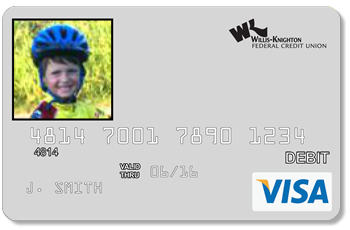 Whatever means the most to you will be displayed on your debit card. It's sure to be the favorite card in your wallet. Upload an image of your choice, following our Image Guidelines, directly from your computer or " choose from an extensive set of gallery images. Once uploaded, the image is displayed behind a template showing the fixed elements of the card. 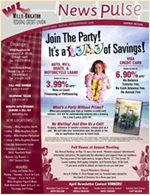 The image can be scaled, flipped or rotated until you are happy with the design. The image is even stored to make reissues a breeze. The card design interface is so straightforward you won't need instructions; and because it runs in Adobe® Flash®, it doesn't require any software downloading. What are my image display options? A good way to show off that great photo you took with lots of room. Use a small photo to personalize your card and show what matters to you. A great way to personalize your card and add security. 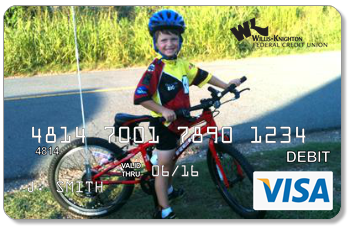 Your card-linked account will be debited $10.00 when your Image is approved. A $13.00 fee will be charged for replaced or reissued myPIC Studio cards that are canceled. See the terms & conditions for complete details. You can read our complete terms & conditions here. Be sure to read our FAQ? Note: By clicking on the link above and ordering your myPIC Studio debit card you agree to the terms and conditions specified on this page. 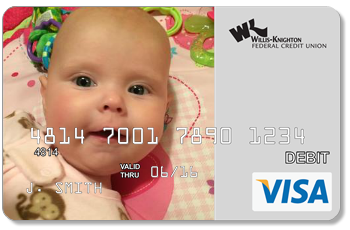 Copyright © 2019 Willis-Knighton Federal Credit Union. All rights reserved.